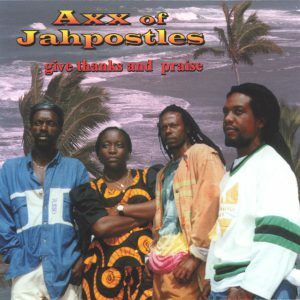 The Axx of Jahpostles began primarily as a band playing the Ocho Rios hotel circuit in 1977. After a while they moved to the U.S.A., to become the number one backing band in Miami. The most memorable period in their career so far came when they moved back to Jamaica, where they teamed up with the late great Garnett Silk, who wanted them as his regular backing band for his live performances. Now they break free of the “backing band” tag with this strong, delightful debut album that showcases their talent, skills and experience as musicians and singers in a mixed set of message and lovers tunes (all fresh and original material). The main ingredients of this album are the impeccable “country” style harmonies, well constructed songs and the energetic and powerful backing for which the Axx of Jahpostles were joined by the cream of Jamaican musicians such as Dean Fraser, Sly Dunbar, Robbie Shakespear, Robbie Lynn, Chico Chin and Bongo Herman. And it must be said, everything really fits together very well. At some point the music of the Axx of Jahpostles even brings back in memory great vocal harmony groups like the Mighty Diamonds and the Meditations. The Axx of Jahpostles are obviously destined for much bigger things and in the meantime this set is a beauty to hold and enjoy. Axx Of Jahpostles’ debut CD “Give Thanks And Praise” is a groove-laden reggae treat featuring “country”-style harmonies, sophisticated changes and well-constructed songs backed with punch and power. Bassist Devon Bradshaw and his late brother Anthony (many of whose songs are featured here) are originally from the Portland parish of Jamaica, played for years in Miami and served on tours with the likes of Burning Spear and Garnettt Silk. 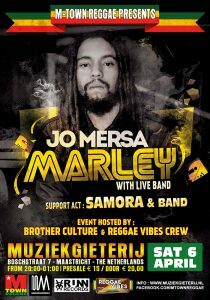 This disc was cut in Kingston at Tuff Gong and Mixing Lab and at Grove Studio in Ocho Rios. Experience and expertise show on this musical delightful set of songs including standouts like “Starlight”, “Babylon Glass House” and “All Kinda Fight”. Vocalists Selassie Thomas and Sharon Myles and drummer Cecil Hardy have Bradshaw’s foundational bass lines from which to work off and the entire disc has the quality of a major label release, while the themes are humble and sincere.